Post players come in all shapes and sizes. You don’t have to be taller than 7 foot 2 and weigh more than 300 pounds to dominate opponents in the post. You don’t have to be built like Shaq or have the height of Yao Ming to own the paint (don’t get me wrong… it defintely helps). There have been many great undersized post players in history including Elvin Hayes (6 ft 9 in), Karl Malone (6 ft 9 in), Charles Barkley (6 ft 6 in), Dennis Rodamn (6 ft 7 in), and many, many more. I’m about to share with you nine secrets that I believe made the players listed above great post-players despite their lack of size that your players can implement into their own games. There’s no better secret to start us off than ‘be willing to go to battle’. It’s a war zone in the paint when you’re an undersized post player. There will be elbows thrown, knees colliding, pushing and shoving; it’s going to get physical. You’re going to have to fight on every play with everything you’ve got! There’s no other way. Playing in the paint while undersized is just as much mental as it is physical. You have to come prepared physically and mentally every time you step onto the court. You must get proficient at guessing where the ball is going to bounce off a missed shot. Of course you’re not going to get it right every time, but the more you focus on this the better you’ll become at it. Reading the flight path isn’t a skill you can pick up overnight. It takes a lot of focused attention and many, many thousands of shots of practice. But there’s no better time to start paying attention to it than right now. Whenever you’re rebounding, practice guessing which direction the ball is going to bounce. One of the few benefits of being an undersized post player is that you have a lower center of gravity. You win the battle of getting your hips lower than your opponents hips. After using secret number two and reading the flight path of the basketball, you must use your body and strength as leverage against your opponent to keep them away from where you think the ball is going to land to give yourself the best chance at it. It’s all about increasing your chances at securing the rebound. Keep in mind that the earlier you get a body on your opponent, the more space you’ll create to get yourself a rebound… so box out early! • You have to make it up and down the floor quicker than your opponent does. • You have to relentlessly pursue every rebound that comes near you. • You have to dive on every loose ball. • You have to be consistently talking on defense. • You have to box out early. What you lack in size you have to make up for in heart, desire, and hustle. You must play smarter than your opponent and think your way through the game. If you have the luck of having seen your opponent play before or, if you play against them on a regular basis, think about what advantages you have over your opponent. • Can you step outside and knock down the jump shot? • Do they have a tendency to foul? • Are they slow on their feet? Determine in what areas of the game YOU have the advantage and strive to put yourself in that position as much as possible throughout the game. If you’re too small to beat them inside then it’s time to step outside for a few easy points (as long as your team offense allows it). When you’re playing on a big man that loves to clog up the paint, step outside and stretch the floor as long as you have a reliable jump shot. This is a huge benefit for your team. If you make a couple of easy jump shots your opponent has to start respecting your jump shot and come out and play you. Now the paint is opened up for your teammates to get to the ring for a few easy scores. When it comes to post moves it’s not only power that can get you points down low. Being crafty, skilled, and smart, can work just as well. To score in the post as an undersized post player you must have great footwork and you must have counters to every move. The best post players will sometimes use 3 or 4 moves in the post before they get their defender off-balance enough to allow them an easy score. I recommend every post player learns the jump hook with either hand, and then which moves to master from there is up to you. As an undersized big you need to get up and down the court quicker than your opponent to establish position. This means staying in shape. You must be well conditioned, eating properly, and getting good rest. We all know big men aren’t usually well conditioned so if you can force them to work hard and stay with you you’ll be playing against a fatigued opponent making it easier for you to push them out of the way. If they can’t keep up you’ll get easy shots at the rim in transition. “That’s how far Rodman had taken rebounding, to a totally different level, like off the charts. He knew the rotation of every person that shot on our team — if it spins sideways, where it would bounce, how often it would bounce left or right. He had rebounding down to a science, and I never heard anyone think or talk about rebounding and defense the way he could break it down. The main thing I want everyone to take from this article is that undersized post players must take advantage of their strengths. Players should take a step back and self-evaluate their game and determine where and how they can be most effective on the basketball court. 1. Be willing to go to battle. 2. Read the basketball’s flight path. 3. Use your body to create space. 4. Have an incredible motor. 6. Master the jump shot. 7. Get crafty with your post moves. 8. Keep your body at peak performance. 9. Count the rotations of the basketball. As a post player, the smaller you are, the more you have to make up for it in heart and smarts. 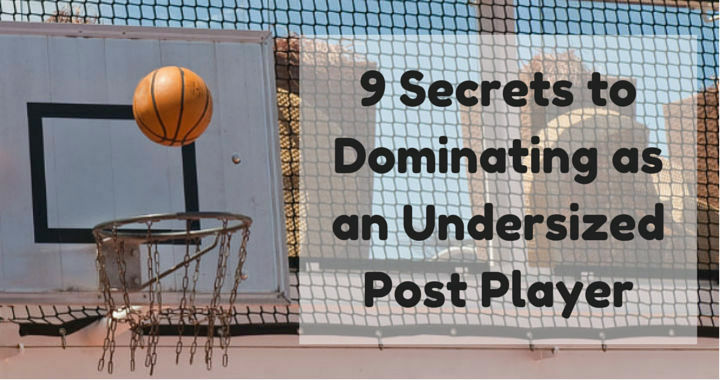 Use these 9 secrets to start dominating opponents as an undersized post player!